A Richmond man died after he was swept over a waterfall in the Sierra National Forest south of Yosemite National Park while leading a group of campers to a swimming area on Saturday afternoon, a Madera County sheriff's spokeswoman said. The body of Daniel Greenlaw, 37, was found at the bottom of Camino Falls around 6:30 a.m. Sunday, sheriff's spokeswoman Erica Stuart said. Greenlaw was a camp host at the Far Meadow Campground. He took a group of six campers to the West Fork Chiquito Creek area to swim Saturday, Stuart said. While showing the group how to slide down rocks to reach a swimming hole at about 2:30 p.m. that day, he went further downstream than intended. He stood up and lost his footing, then fell into the rushing water and was swept over the 100-foot waterfall, Stuart said. A search party was sent out when Greenlaw and the campers did not return to camp by 11:30 p.m. Around 3 a.m. Sunday, a search-and-rescue crew found the vehicle the group had taken to the swim spot. About an hour later, six campers were found, Stuart said. The hikers were a 56-year-old Illinois woman; a 19-year-old woman; two girls ages 13 and 8; and a 44-year-old man and woman 43-year-old woman from England. 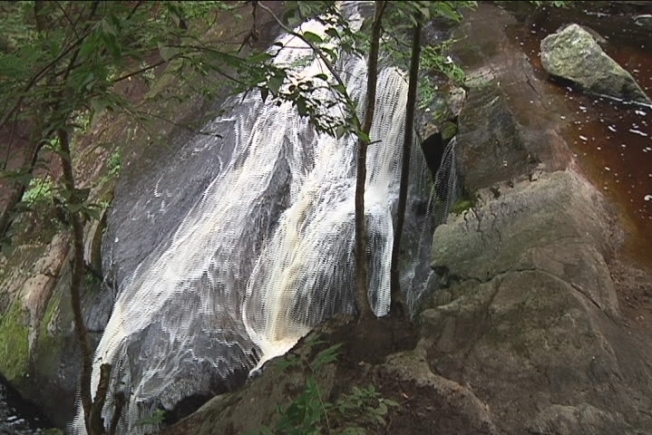 The campers had been unable to find the vehicle and had become lost in the wilderness after their group leader went over the waterfall, Stuart said.